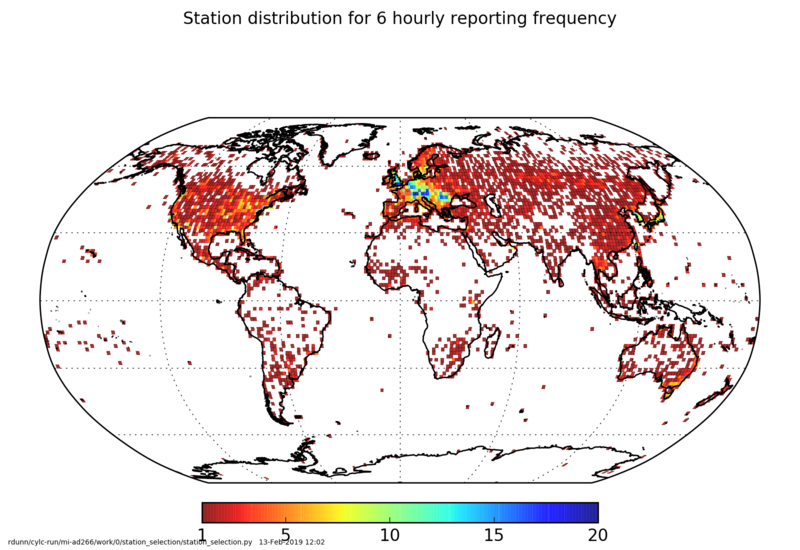 HadISD is a global sub-daily dataset based on the ISD dataset from NOAA's NCDC. As well as station selection criteria, a suite of quality control tests has been run on the major climatological variables. The data span of version 3.0.1.201903p is 1/1/1931 to the end of March 2019 and each station is available individually. The first version of HadISD was 1.0.0.2011f (covering 1973-2011). HadISD v1.0.x and v2.0.x have been superceded and are no longer being updated. Previous versions are available at the links below. A preliminary version of HadISD.3.0.1.201903p is now available here. This new version spans 1/1/1931 to 1/3/2019 and replaces version 3.0.1.201901p. There will be at further updates to this dataset at roughly monthly intervals, appending data from 2019 only. The next will be v3.0.1.201903p in April 2019. No data in previous years will change until the release in January 2020 (v3.0.1.2019f). Until that point, if you see anything untoward in this dataset, do let us know. A station listing with IDs, names and location information is here (also with names). The data are provided as netCDF files, one file per station. The variables that are quality controlled are: temperature, dewpoint temperature, sea-level pressure, wind speed and direction, cloud data (total, low, mid and high level). Also included in the files are past significant weather and cloud base but these have not been quality controlled and we make no guarantees about their quality and completness. Also available are the quality control flags and the data values which have been removed in the quality control process. For older versions please contact the dataset maintainers. Follow us on twitter: @metofficeHadOBS for updates, news and announcements. For more detailed information, follow our HadISD blog. Here we describe bug fixes, routine updates and other exploratory analysis. v3.0.1.201903p data are available from the download page. Please read the terms and conditions. The python code used for the station selection and quality control from version 2 can be found on github. That for version 3 will be available in due course. The IDL code used for the quality control and final filtering for version 1 can be found here. We do not intend to provide in-depth support for this code. We emphasise that the choices we have made in the QC and also the final filtering are one of a number of other equally reasonable choices, and encourage other interested parties to develop their own QC and filtering procedures to allow the structural uncertainties of this sub-daily dataset to be investigated. We have assessed the homogeneity of four of the observed meteorological variables present in HadISD: temperature, dew point temperature, sea-level pressure and wind speed. This has been performed on monthly averages of the sub-daily data, and is fully described in Dunn et al, 2014, Climate of the Past, 10, 1501-1522. The homogeneity assessment results for v3.0.0.2018f are available for download here. A number of summary and diagnostic outputs from the quality control code as well as station lists for a number of selection criteria are available for v3.0.1.201903p here. We have adapted our versioning system from CRUTEM4, and so the dataset numbering is of the form HadISD.X.Y.Z.1234i, and is outlined in more detail in the paper linked above. X is for a major change and would be accompanied by a peer-reviewed paper. Y is a more minor change, e.g. in one of the QC tests and would be described in a tech-note. Finally Z is a small change, for example addition or changes to data in the past. The last complete year of the dataset is given by 1234, and the final character shows if the dataset is f-final or p-preliminary. Therefore HadISD.1.0.1.2012f would be the final version of the dataset containing data up to the end of 2012, and there have been some changes to past data over HadISD.1.0.0.2011f. NEW: A number of images and movies created from HadISD to show its capabilities are here.